I have to say, ive enjoyed your books off and on for years now. I was wondering tho if they were available via ebook, specifically in ePub format? Ive moved over to reading electronically over the last 2 years and im tring to work up my library of books again. The paper backs etc were just taking up too much room finally and hard to keep organized. thank you, and I look forward to reading and rereading your stories over and and over again. Hmm... I'm afraid I'm not familiar with the ePub format (or ebooks in general - I'm still a paperback-and-armchair person, myself). Of course, these are just the legitimate, legal copies that I know about. My son tells me there are a lot of unofficial copies of my books running around on the internet. For obvious reasons, I'd appreciate if you could buy the legitimate copies if they're available. And, of course, you can always stop by here for more short stories and novels. I have a few unpublished novels I'm planning to release a chapter at a time on my website. It isn't too hard to convert a document file to an e-book. I'd be more than happy to do it, for no more reason than that I'd love to have the Starship Troupers, the Wizard in Rhyme, and the Gallowglass tales on my laptop. My .dtf copies (that is, Dead Tree Format,) are getting pretty ratty from overuse. I have a rather extensive library, both electronic (.lit - (MS reader) and .lrf - (sony) format) and paper, and although I do enjoy the sensual experience of a leather couch and turning paper pages, it is not practical to take 500+ paperbacks with me when I have to travel. That same 500+ books "on digits" (as we in the army commonly call electronic formats) can be carried on a card that is about an inch square and no thicker than a credit card. Convenient when weight and space limit your options! If you have the rights to publish your older work, you might consider what Eric Flint and a number of other authors are doing; They offer the first book or two of a series free of charge, no strings. They have all seen sales of their other work (mostly the sequels) go up considerably as people discover them and want more. Just a thought, from a fan of 20+ years. Here's hoping that you will invite us in to your imagination for another decade or two before hanging up your pen. I second the comments made by kf6eml and the others. Please make your books available as ebooks. Kf6eml mentioned Eric Flint, and if your interested in seeing how that works, please take a look at http://www.baen.com/ and give them a call. I look forward to once again reading the Warlock series, as well as many of your other works. An author, even one with as well known and respected a name as Mr. Stasheff, can't just "give them a call" and expect them to jump. Even if he retains the rights to his work, publishers aren't very likely to jump at a chance to reprint old works unless they have shown strong sales for a long time. There has to be an expectation of making a profit. They are a business, after all. They are even less likely to give advice based on their own hard won experience to their competition, free of charge. Also, don't forget that authors and publishers have contractual agreements that limit what either of them can do with the work, sometimes for many years. He may not have the rights to publish all of his work with a different publisher or on his own. There are many steps to publishing, and even e-books have to follow many of them. Individually, the steps aren't so hard. The point of my earlier post was that there is software available that makes producing professional quality e-books easy, once you know how to use it. The promotion and distribution are separate problems. I could have been more clear on what I was offering there, though. That is my fault. I offered to "do it" i.e. produce an e-book. I am certainly interested in getting good copies of these books, and am perfectly willing to to the majority of the work, but I do not have a professional-quality e-book compiler. The publisher will have to bear that expense. I am not willing to pay hundreds of dollars for professional software that I will use maybe half-a-dozen times for no financial return. Publishers will not be willing to do any of the work or use their own software without pay, either. All I can offer is a set of files that can be easily converted by the program into a finished book. Don't forget that there are numerous e-book formats. Each one has to be compiled and checked separately to make sure it is a good file. Finally, volunteer labor is not really dependable. I am half-way around the world, fighting a war. However much I may enjoy doing this, my job may require me to break off in the middle and not even offer a reason for my disappearance. In short, making an inventory of e-books will most likely cost a lot of money, and not offer a guarantee of any commercial success. Have patience, and let them weigh the risks and potential rewards. They know what they're doing. Well, if nothing else, it will take time, even if every other step of the process is relatively quick and easy. As I mentioned before, the first thing to do is check out the legal situations - contracts, copyrights, etc - and see if it is even possible. Unfortunately, corporate bureaucracies are not exactly known for their quick response times, especially if it's an answer they'd rather not give. 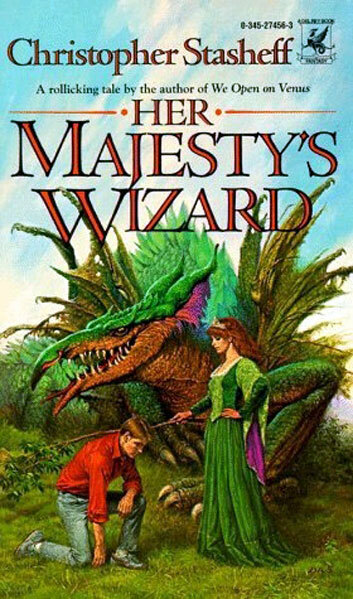 For example, back in the 1980s, it took seven years for Her Majesty's Wizard to make it through the publication process, from when the manuscript was submitted to when it hit the shelves. Be assured that we're looking into the ebook publishing thing, especially since there is clearly such a demand for it. But it will take time, so please be patient. A quick update: I'm working on turning "Her Majesty's Wizard" into an e-book. I'm working from a bootleg copy, and the formatting is horrible, but I am cleaning it up (up to Ch. 7, now,) and it is coming along nicely. I'm not making any changes to the text, except that It looks like it was scanned from a paper copy, and those programs are not perfect, so I do have to make the occasional change when a word is obviously misspelled or used in improper context. In short, the story will be completely unchanged, though an occasional word or punctuation mark may differ from the original. Also, I only have a cover image downloaded from a bookseller's site, so it's not the greatest, but it'll do as a demo. When I'm done, I will email the file to Mr. Stasheff or his representative in whichever format you prefer for your opinion. If you like it, and if you want to publish it, we can work something out. I am not referring to money; I have no intention of charging for labor - I am learning a lot from this, and I'm rather enjoying myself. I couldn't imagine getting paid for it! Rather, I am referring to getting the specifics of what needs to be included in the copy, whatever style changes you want, a new cover image (this one is low-quality, has some extraneous printing and a publisher's logo on it,) and so forth. For what it's worth, I already own a paper copy of the book, and I do not intend to share this copy with anyone but the author, (or his people,) so as far as the ethics of having/making a "bootleg" copy are concerned, I see no problem. If the author objects, then I will drop the project. But as I work on it, I have to read the story... twice! So for all the problems, I'm having a good time, anyway. I'd forgotten how much I had enjoyed this book. It's funny how reading an old story like this can take you back to where you were when you first read it. I find myself remembering high-school in full, vivid memory, with colors, sounds, and even the slightly disgusting smells from the cafeteria! Somehow, I can't help but believe that this will happen with all these old books, no matter how old I get. You can find a high-quality cover image of HMW on this site at http://christopher.stasheff.com/art/art ... rd-BIG.jpg. I'm trying to collect high-quality images of all of Stasheff's book covers (and I do mean all), and we've done quite well so far. So check this site first for cover art - it might save you some time. And once again, thanks for all your help and hard work! I am in process of getting the ebooks (for all the series, not just Wizard in Rhyme), in addition to the print copies I have. My only problem is The Feline Wizard. $11.99 and up for an ebook? That is insane. Electronic storage costs nothing, and there is no transport costs involved, nor is there paper, glue, ink, etc. to consider. As much as I love these books, and your other series, Mr. Stasheff, I am certain you will understand not wanting to spend that much on a few electrons. Especially when the other books are in the $4-$5 range.